The new Journey Church will be located at 9009 Clydesdale Road on a 12.6-acre section of land between the Surrey Ridge and Oak Hills neighborhoods. If Douglas County approves the plan project, construction will begin in mid-2016. Journey Church’s front main entrance faces north and appears to be a one-story building. The main worship area is on the main level. The church is actually a two-story structure with the south side lower level 43 feet tall with entrances to classrooms and a gathering area. 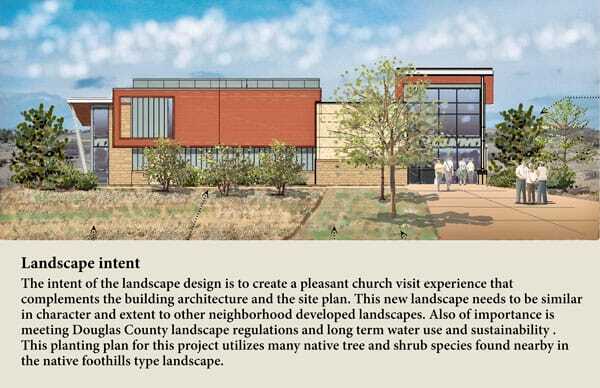 The project plans for a new contemporary-style Journey Church located on 9009 Clydesdale Road between Oak Hills and Surrey Ridge were submitted to Douglas County Planning Department and other key county agencies in mid-November. “It takes a while for our submittal to get reviewed by all of the Douglas County referral agencies including the fire department, traffic engineering, public works, Tri-County Health, etc. We expect approval sometime in early 2016,” noted CEO of Development Advisors Scott McLean who oversees all aspects of the project. 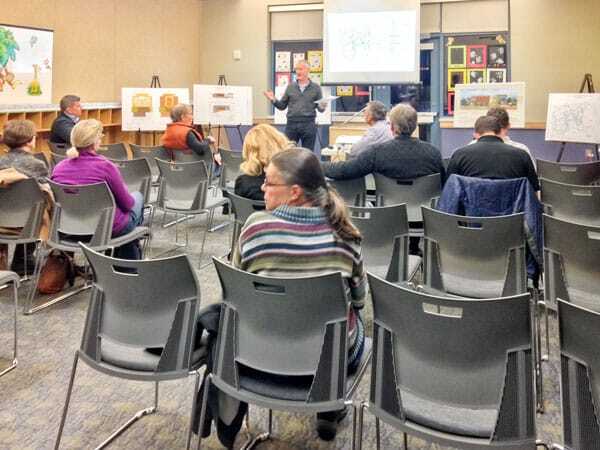 Scott McLean of Development Advisors gave a presentation of the Journey Church building plan to a small group of interested residents. The project plan outlines a 24,000 square-foot structure to be built in two phases. The initial phase one will be a 14,250 square-foot two-story building. The front north entrance of the church’s main level will appear as a one-story building (see elevation drawing). The auditorium service area has 350 seats on the main level, as well as the lobby, restrooms and refreshment area. The south side of the structure will be 43-feet tall and open into the lower level where six youth classrooms will be located. There will also be a nursery, toddler room and gathering area on the lower level. No plans have been developed for the remaining 9,750 square-foot phase two. The parking area includes 155 spaces. Water for the church will be supplied by an existing well that feeds three water tanks – one for fire protection, a domestic tank, and an irrigation tank. Two septic systems will be installed on the south end of the property. 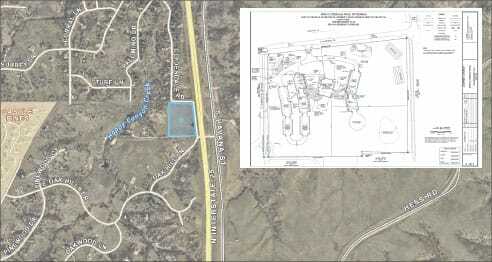 The Colorado Department of Transportation’s run-off pond will remain on the property and a much larger detention pond will be placed in the southwest area of the 12.6-acre site. There will be some signage but it has not been designed or determined where it will be placed. Priest stated that the new church will hold two Sunday services with approximately 600 people total attending both gatherings. “If the congregation grows, more services will be added,” noted Priest. Weekday programs will also be held in the building including youth events. There is no plan to open a school. If the project gets final approval from Douglas County, the plan is to begin construction in mid-2016. For more information, visit http://www.douglas.co.us/government/departments/community-development/planning/ and click on Project Records Online; the project number SP2015-023.